It's official. Aside from letting loose its first set of headphones post Monster for the Executive types, Beats Electronics has set its sights on nabbing the portable Bluetooth audio crown from Jawbone's Jambox. You'll recall this hitting the FCC a bit ago, but today the Dr. is officially ready to offer you it's remedy for on-the-go wireless audio with its $200 Pill, an NFC-equipped portable Bluetooth 2.1 speaker. Coming in your choice red, black or white, the cylindrical system is loaded with a quartet of 1-inch drivers, and supports codecs including Apt-X and AAC. An internal battery is said to provide about seven hours of listening at around 75-percent volume (80 decibels), and the unit can be charged via its Micro-USB input. Notably, an auto-off feature turns the unit off after 30 minutes if no audio is streamed to it. As you'd expect, the Pill features a front-facing on-board mic for use as a speakerphone, physical volume buttons and power button, as well as a 3.5mm input if you'd like to play sans Bluetooth. We're also pleased to notice that the diminutive system also features a 3.5 output if you'd like to send the audio out to another audio ware. The Pill comes with a 3.5mm to 3.5mm cable, a USB to Micro-USB cable for charging with an included wall adapter and, lastly, a carrying shell case that can be hooked to a bag. We've been able to spend about an hour with the system, and we're frankly come away very impressed. The unit feels very sturdy, with a stiff metal grill and soft-touch coating around the rest of its exterior. It feels very comfortable to hold in a hand, and will easily fit in a jacket pocket. Actually, one of our only initial complaints is that the included carrying shell doesn't leave any room for the included cables. All of the buttons have a soft, slightly clicky tactility, which also aids to its premium feel. Using it initially alongside one of Beats' on-hand Jamboxes in a wired A/B comparison, the Jambox came out sounding like a distorted, rumbling mess up against the pill -- we even had a rep bring out a second unit confirm that it wasn't a dud. If that wasn't enough, the Pill also manged to get much louder, staying fairly clean (in comparison), and without rumbling on the table as the Jambox did very slightly. As a triple-check measure, we later came up with a similar outcome with our in house unit of Logitech's $99 UE mobile boombox -- a speaker we find comparable in sound, if slightly better, than the Jambox. In what could be viewed as slightly ironic, the Pill has a voicing that edges toward the flatter side of things, rather than pumping out exorbitant amounts of bass. It's not to say that it can't reproduce bass at all, it's just not the focus here. This flatter output seems to be a big part of what keeps it from distorting, but we should be clear, that the audio here is many times better still on the Pill. Pleasantly, the speakers are also angled up slightly, which makes makes for a noticeably more natural listening experience. Our only other concern for the time is that the Bluetooth connection with our iPhone 5 did crackle occasionally like a vinyl record, but it's too earlier to say if the issue will be consistent during future use. We're still a ways off from being able to definitively give you a thumbs up on the Pill, but -- at least, initially, it seems like it's easily blowing the Jambox and similar speakers out of the water Like the Executive headphones, the Pill is available today at Beats stores and other retailers -- check out our video hands-on after the break for a better look. 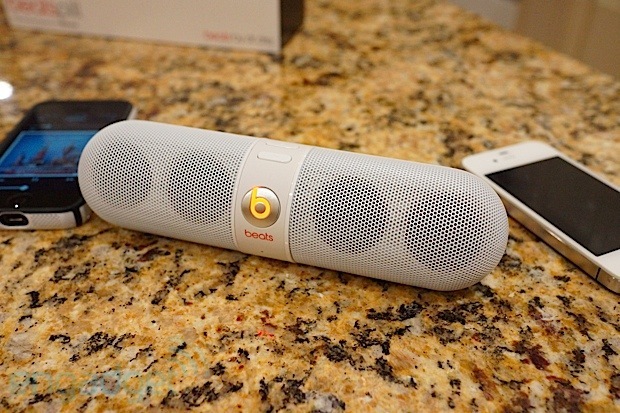 Beats by Dre Pill portable Bluetooth speaker officially drops, we take one per the Dr. and go ears-on originally appeared on Engadget on Tue, 16 Oct 2012 11:30:00 EDT. Please see our terms for use of feeds.